In one of her first Opinions from the bench in the Federal District Court for the Middle District of Pennsylvania, Magistrate Judge Karoline Mehalchick thoroughly reviewed the current status of the law pertaining to the attorney-client privilege and the attorney work product doctrine. The case before Judge Mehalchick, entitled Dempsey v. Bucknell University, No. 4:11-CV-1679 (M.D.Pa. Oct. 7, 2013 Mehalchick, M.J.), arose out of a breach of contract claim filed by a student against the university relative to student conduct hearings held. At issue were certain documents withheld from discovery by the plaintiff in response to the defendant's Rule 34 discovery requests on the grounds of the attorney-client privilege and the attorney work product doctrine. Judge Mehalchick's 33 paged Opinion provides a nice overview of the current status of the law in Pennsylvania with respect to these two doctrines. Ultimately, the plaintiff's objections to the need to produce various documents pertinent to the litigation were sustained in part and denied in part by the court. One interesting aspect of the Opinion involves the court's analysis of whether documents needed to be produced in light of the fact that the student-plaintiff's parents were privy to such documents. The court noted that some of the documents prepared by the student-plaintiff's parents, as agents to their son's attorney and in the preparation of the son's defense, were found to be protected from discovery. Anyone wishing to review Judge Mehalchick's Opinion in the case of Dempsey v. Bucknell University may click this LINK. 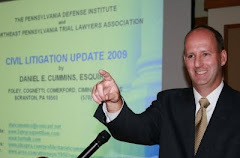 I send thanks to Attorney Harry Coleman of Coleman Law Offices in Carbondale, Pennsylvania for bringing this case to my attention.